German soldiers in a dug out waiting for an enemy artillery barrage to lift, 1917. Fifteen pensive looking faces, each man contemplating his fate as they await the enemy barrage to lift and prepare to repel an enemy assault. The original text on reverse: “Real photo taken of German infantry in a dug out. This is a typical dug out, and you will notice there isn’t room enough to lay full length. To dear Hilda from Bernard”. These soldiers are Stosstruppen (Stormtrooper) and are waiting for the assault in their shelter. Notice the different kinds of bayonets issued by the German army. At the end of the war, the German army issued a new kind of saw-bayonet causing more damage to the human body than the classic ones.The soldiers caught carrying such bayonets weren’t taken prisoner but were horribly mutilated. 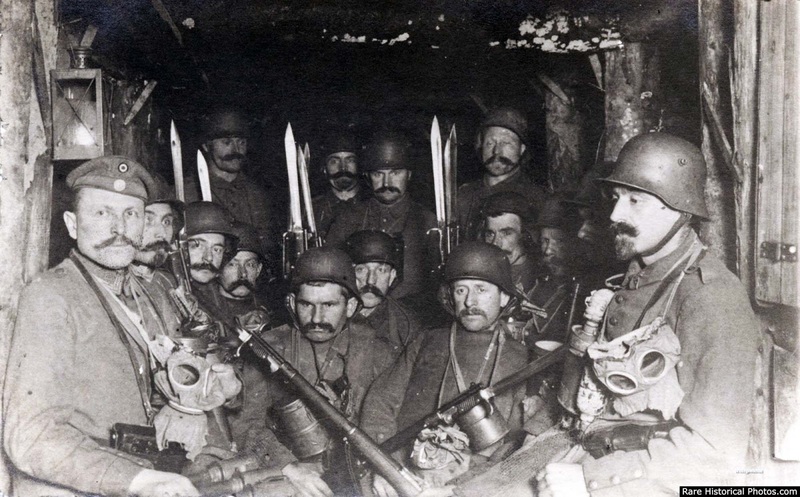 All the soldiers in this picture have facial hair without having a beard, because having a beard made it difficult to get a proper seal on the gas mask. The two men in the center are wearing trench armour or Grabenpanzer. Delivered towards the end of 1916, the model 1916 Grabenpanzer was, depending on the size, a 9 kg (20 lbs) to 15 kg (33 lbs) construction made of four steel plates which protected the wearer against bullets and shrapnel. The helmet they’re wearing is the Model 1916 Stahlhelm – known to the British as the “coal scuttle” due to its distinctive shape. It first entered service with the Germany Army during the Battle of Verdun in 1916. The new model greatly increased the survival rates of German head casualties. Everything but the bayonet info here is correct. Regarding the bayonets, the "saw-backed" bayonets were not issued late but instead earlier and typically to engineers and NCO's not for more lethal wounds but to be used as a sawing tool on barbed wire and the like. However, enemy soldiers did assume it was for more sinister wounds and supposedly did kill and mutilate soldiers found with them, resulting in many if not most German soldiers issued with the "saw-backed" bayonet to grind the saw teeth off. For this reason original examples are relatively rare and numerous original bayonets can be found with a dip along the back from where the saw teeth were removed.